Our products are ideal for companies and professionals that organized EVENTS for own business, for own company or for other person. For these we offer a free consultation to identify the solution that best suits your specific needs, with a possible visit for the evaluation of spaces and products to be inserted. 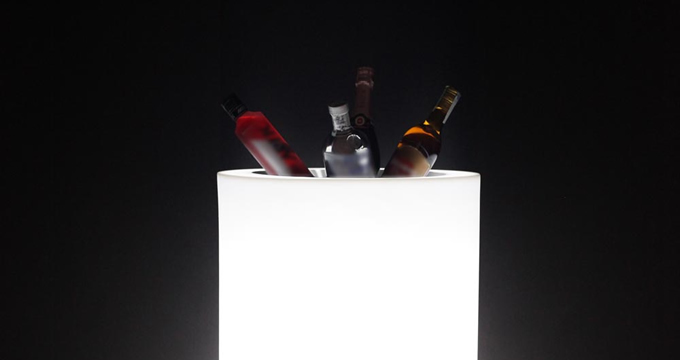 You can create UNIQUE ATMOSPHERE through the light that can be made with our products in light version (white light or colored light with RGB LED). We propose a specific ACCESSORY for Event as ice-bottles holder kit (see the picture below) and the possibility to customize products with the inclusion of the logo or any other wording (optional) and/or made them in any moulded colors of your choice different from available standard colors (optional). Also we offer upon request the service of FREE STORAGE of products in our warehouses at the end of the event. To learn more about Events offer, fill the Request Information form in CONTACT page with “Events” in the subject line or call at (+39) 011.95.29.398 and you will be helped by one of our dedicated consultant.